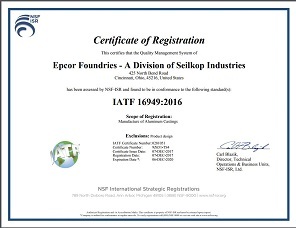 Epcor Foundry, a division of Seilkop Industries, Inc., offers comprehensive medium to high volume aluminum sand casting & prototyping, automotive casting & finishing services. We specialize in quality and flexibility, providing raw or finished green sand castings including highly cored leak tight castings, rapid prototypes, high speed horizontally parted moldings, and highly automated production castings. Our DISA Match and Sinto machines are the most precise, technologically advanced, machines on the market. 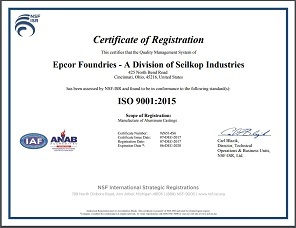 We believe that continued capital investment in automation technology and lean manufacturing allows us to provide customers with the highest quality castings at competitive prices. Casting capabilities include all part sizes from miniature to heavy castings up to 22” x 18”. With a 220 ton capacity sand silo and a stack melting furnace capable of processing 3,000 pounds per hour, capacity is not an issue. The furnaces are equipped with PLC controls and temperature data collection for precise monitoring of furnace conditions. Back-up power and in-furnace filtration maintain material quality en route to the molding machines. In addition to raw casting, we offer a variety of machining and finishing services such as de-coring, CNC sawing, grinding, vibratory finishing, heat treating, machining and plating. These services are completed with the same precision that has allowed us to grow into an industry leader as a casting supplier to the automotive industry. Our quality system is TS certified and dimensional and material inspections can be performed to customer specifications using precision gauging and CMM equipment. SPC tracking and monitoring as well as part marking for date code traceability are also available. For more information about our aluminum sand casting capability, see the table below, or contact us directly.